Clatsop County Commissioner Kathleen Sullivan delivered a message from her rural county to the Oregon Legislature during legislative hearings on two bills addressing two controversial pesticides. Commissioner Sullivan testified in support of SB 853 and HB 3058, two nearly identical bills that would ban the organophosphate insecticide chlorpyrifos. A broad coalition of Oregon businesses and farmers support these bills, including the Oregon Grange, biodynamic vineyards, vegetable farmers and beekeepers, as well as health professionals, environmental advocates, organic grocery stores and labor representatives. Chlorpyrifos is used on common foods we feed our families, such as strawberries, apples, broccoli, beans, oats and more. She urged Oregon legislators to rely on modern science. That science says, without a doubt, there is no safe level of chlorpyrifos for children, neither for a fetus in the womb, nor during a child’s developmental years. The science is clear, but resistance arises when farmers are asked to change decades-old practices and products. Many use older organophosphate pesticides that were originally developed as nerve gases for warfare. Some of these farmers came to testify about how effective chlorpyrifos is. Sure, something powerful enough to kill soldiers can also kill a lot of bugs! The problem is that chlorpyrifos also kills bees, birds, butterflies and disrupts a child’s brain for life. We should consider that the Environmental Protection Agency (EPA) was set to ban chlorpyrifos in 2016. However, in 2017, former EPA Administrator Scott Pruitt rejected the Agency’s plan–even though the EPA’s own scientists determined that there are no safe levels of use for chlorpyrifos on food. Chlorpyrifos also causes serious health problems in those who have been exposed to it, particularly farm workers or families eating fruits and vegetables sprayed, or drinking the water where pesticide runoff occurs. Chlorpyrifos is used in Oregon on everything from apples to grass seed production, and is found at unsafe levels in food and in our streams. Dr. Megan Horton, a researcher at the Icahn School of Medicine at Mount Sinai, has looked at children’s brains and documented an alarming impact when infants or pregnant women are exposed to chlorpyrifos. Horton told legislators that she uses magnetic resonance imaging to study the brains of children as they develop from birth to adolescence. She and her research team see “structural changes in brains” of kids exposed to low levels of chlorpyrifos even at levels below what is considered safe by the EPA. These changes can lead to permanent brain impairment. As chlorpyrifos levels in a pregnant woman increases, her child’s intellectual capability can suffer. The child can experience a childhood of behavioral problems and developmental delays. Researchers warned legislators of the immense impact these children will have on both the financial and staffing resources of local school systems throughout the state. It should be noted that farmers who testified at the hearing could not refute the evidence that chlorpyrifos is unsafe at any level. What they want is assurance that they can keep on doing what they love to do – growing radishes, wheat, hazel nuts and all manner of agricultural crops. We all share that goal! Yet, there were marked differences in farmer testimony. Fear-based farmers spoke of losing their crops if a ban on this single outdated and dangerous pesticide changed their practices, while hope-based farmers talked about using innovation and safer chemistries to work in balance with the land and harvest nutritious crops – without poisoning pollinators and drinking water. One farmer, a mom with kids, testified that when she sprays chlorpyrifos around the farm, she protects her children from exposure by washing her clothes in a separate wash cycle. Of course, no mother wants to poison her family, but does she wonder about the chemical residues in the washing machine, or where the pesticide ends up when it goes down the drain, or how chlorpyrifos could contaminate her neighbors’ drinking water? Does she think about the exposures to the workers on her farm? Will she notice if their children experience difficulties in school and in society? Exposure to chlorpyrifos can radically alter a child’s life direction. Hawaii has already banned chlorpyrifos to protect their people and their pollinators. Clay Wesson, a representative of Willamette Valley Vineyards, a biodynamic wine maker, was hopeful that Oregon can lead the agricultural industry away from devastatingly harmful pesticides. “I have confidence that the farmers in Oregon are brilliant and can find an option,” he said. “And there are other options.” He was thinking of biodynamic solutions that create healthy soils and sustain beneficial insect populations. Wesson is part of the new generation of farmers who help make Oregon fourth in the nation for sustainable agriculture, with $269 million in organic sales in 2016 — a $32 million jump from the preceding two years, according to the National Agricultural Statistics Service. We support a healthy vision for Oregon’s future. This approach is possible when our leaders in the state capitol turn away from fear and embrace the wisdom of science and hope. Oregon needs to ban chlorpyrifos so that future generations will have the joy of watching a soaring bald eagle and a fluttering Monarch butterfly, eating honey from Oregon bees, and seeing Oregon kids reach their full creative potential. This vision can be shared by all Oregonians when state legislators vote to ban chlorpyrifos and make Oregon one of the world’s most innovative and sustainable farming economies. Have you noticed the red and white emissions stack to the east of I-5, just north of Salem? That is the Covanta Marion Municipal Solid Waste Incinerator. Covanta is a large corporation owning Oregon’s single trash incinerator. If you care about climate and resiliency, then you’ll want to know about the poison pill Covanta has inserted into this year’s legislative deliberations on the Clean Energy Jobs bill and renewable energy programs. A number of organizations are working together with Beyond Toxics to warn the public and legislators that Covanta is up to trashy tricks to undermine the goals of the Oregon Climate Action Policy, commonly known as the Clean Energy Jobs bill. Covanta is asking state lawmakers to certify that their company is eligible for tax credits reserved for renewable energy projects, retroactively back to 2011 and into the endless future. That sneaky maneuver has made it into the form of a bill: SB 451, sponsored by Senator Lee Beyer “at the request of Covanta.” Senator Beyer claims he’s promoting SB 451 because of a “promise” made 10 years ago by former Senator Chris Edwards, who now works as an industry lobbyist. Why should Senator Beyer be bound by a decades-old “promise” from someone else who, at the time, was not aware of today’s climate science and the urgency of reducing CO2? It is nonsense to give away tax credits that should be reserved for truly renewable energy companies, such as those creating energy via solar, wind and thermal. Covanta is also “fired up” to get an exemption from the carbon reduction requirements of the Clean Energy Jobs bill. HB 2020 Section 10 (2) gives Covanta a free pass from having to pay into the cap-and-trade program and reduce their carbon emissions. The problem for Covanta is that it is one of the largest emitters of carbon dioxide in the state of Oregon! According to the Oregon DEQ, Covanta is the 20th largest source of CO2 emissions among industrial sources with air quality permits in the state. The trash Covanta burns, and the pollution released from all that burning, generated 160,843 metric tons of carbon dioxide equivalents in 2017. Burning trash is neither clean nor renewable, especially because Covanta burns a lot of plastic. Plastic is made from fossil fuels. In other words, by burning plastics, Covanta’s “renewable energy” plant is just more of the daily grind of extracting fossil fuels to create throw-away items that then pollute our bodies, wildlife, oceans, air and lands. Worse yet, a lot of the plastic Covanta burns is hazardous medical waste imported from other states into Oregon. Covanta has contracts now and is seeking more contracts to haul some other state’s trash to burn in Oregon, releasing pollution into our skies! The trashy, ashy fall-out is dispersing toxic chemicals into the backyards of vulnerable communities in Woodburn and Northeast Salem. According to the US EPA, the area within a 7-mile radius of where Covanta sends air pollutants into neighborhoods ranked in the 88th percentile for cancer and respiratory risks (using National Air Toxics Assessment data) and 83rd percentile for minority, low-income and linguistically-isolated compared to other areas in Oregon. This doesn’t mean the Covanta incinerator is entirely to blame for the excessive burdens of cancer and respiratory disease, but it is making a sizable contribution to poor air quality that harms local and vulnerable communities. This makes Covanta an environmental justice problem. To make the same amount of energy as a coal power plant, trash incinerators release more DIOXIN, more CO2, and more CARBON MONOXIDE, NITROGEN OXIDES, and SULFUR DIOXIDES. According to their Oregon air pollution permit, Covanta also emits approximately 15 tons of HYDROGEN CHLORIDE annually across the last decade. HYDROGEN CHLORIDE is a corrosive air pollutant that results in acid rain and is a respiratory irritant. Incineration of plastics, such as the PVC in hospital waste, results in releases of hydrogen chloride. As sad as the picture I’ve painted is, there is something you can do about this situation today! You can help keep municipal solid waste incineration OUT of Oregon’s renewable energy portfolio and IN the Carbon Cap-and-Trade Program. HB 2020, the Clean Energy Jobs bill, is being amended this week and your involvement is time-sensitive! Please send an email to the Joint Carbon Reduction Committee at jccr.exhibits@oregonlegislature.gov TODAY! Urge them to delete Section 10 (2)(b) of the bill exempting municipal waste incineration and let them know that Oregon’s only solid waste incinerator–the 20th largest emitter of CO2–must be included in the carbon cap. Covanta must be held accountable for reducing its greenhouse gas emissions like other big polluters. Then tackle SB 451, the bill that would let Covanta cash in on a decade’s old “promise” to qualify them as renewable energy. Send your next email to the Senate Environmental and Natural Resources Committee before March 11 at senr.exhibits@oregonlegislature.gov. This email address will send your message to all the members of that committee! Tell these legislators that burning other people’s plastics and trash is neither clean nor renewable. Let them know that Oregonians prefer to uphold our obligations for a healthy planet for future generations rather than keep baseless, old promises from a former legislator-turned-lobbyist. Want more details? 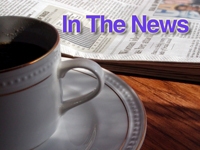 Read to the coalition letter sent to top legislators about Covanta. Thank you for taking action to keep a promise to the next generation. We must NOT remain silent. I’m counting on you to share with me the responsibility of solving a climate crisis capable of destabilizing entire eco-systems and devastating our communities. Each action you take brings us closer to sane and sensible solutions we can be proud to pass on to future generations of Oregonians. It may be easier to be concerned about wolves, salmon and eagles perishing than it is to feel remorse over dying Ponderosa pine trees. Yet, the presence of giant, old growth Ponderosas in central Oregon is as emblematic of a place as any furry, swimming or flying creature. What would it say about our stewardship of Oregon’s natural resources if we allow the continued use of an herbicide that easily killed off nearly 1500 majestic Ponderosas? This poison, Aminocyclopyrachlor, dubbed ACP because of its tongue-twisting name, was banned from residential, business and golf course use by the U.S. EPA 5 years ago when it was manufactured by DuPont. Then Bayer Chemical bought the “rights” to make and market ACP. Bayer rebranded the poison to put it back into use. As far back as 2015, when the US Forest Service realized that ACP was being used on highways that ran through public forests, the agency asked the Oregon Department of Transportation (ODOT) to stop using ACP. Forest Service scientists realized the high risk of killing trees could not justify ACP roadside sprays. Yet ODOT and county road departments ignored the warning and continued spraying toxic ACP along many of Oregon’s roadways. I’ve started to wonder … perhaps those ailing fir and pine trees I’ve noticed along various highways are not symptoms of a warming climate, but are struggling to survive from absorbing ACP? Will we ever know? ACP is undoubtedly a potent poison. Road vegetation managers spray it along the sides of roads to kill unwanted weeds that may interfere with visibility or be considered a fire hazard. ACP is good at killing noxious weeds, and yes, noxious weeds are a problem in central Oregon. But when do the ends justify the means? Roadside weed managers say they need ACP because the weeds have become resistant to other herbicides such as glyphosate. Like going from guns to chemical weapons to nuclear weapons in warfare, are we going to repeat the same mistakes in our environment? Will we as a civil society accept ever-increasing devastation from dangerous products in a downward spiral of environmental destruction? Just because the old ones don’t do the trick anymore? What we need are safer alternatives and a paradigm shift toward protecting environmental and public health in roadside management! Here are the frightening facts. ACP was sprayed on a 6 ft. swath along the very edge of Highway 20, yet giant Ponderosa pines are now dying, including trees as far as 75 ft. from the sprayed road. This pesticide moves easily in the environment; the pattern suggests that ACP gets into ground water and is taken up by the roots of thirsty trees. Root zones of pine and fir trees can stretch long distances in all directions from tree trunks. From its investigation into what killed the Ponderosa pine trees, the Oregon Department of Agriculture found that ACP was detectible in the pine needles high up in trees three years after the chemical was used. The trees themselves have become so poisonous they now must be removed from the forest floor where decomposition can continue to spread the chemical’s harm. Sawdust and bark chips from these trees are hazardous waste and can never be used for soil amendments. ACP is currently being used in seven counties across our state. I’m proud that Lane County’s Public Works Department does not allow the use of ACP because it developed a strong integrated vegetation management program based on science and environmental health benchmarks. The Oregon Department of Agriculture is proposing to severely restrict its use by adopting new regulations. The Agency’s staff is doing their due diligence and their recommendations are commendable. Importantly, ACP will not be allowed near “desirable” tree roots, in wetlands and other surface water sites, wildlife management and habitat areas. But according to the ODA’s own calculations, the new rule will allow as many as 242 spray areas of 9 sq. ft. per acre every year! It is time to stop, not restrict. ACP is a danger to entire ecosystems of living old growth trees. It is unpredictable in the environment and poses a threat to ground water everywhere it is sprayed. Does Oregon want to apologize to future generations for the loss of Oregon’s iconic Ponderosa forests? I’d rather we thought ahead and acted decisively in their interest – today! Krystal Abrams, Social Media and Pollinator Projects Manager for Beyond Toxics collects food samples for the FOE study. 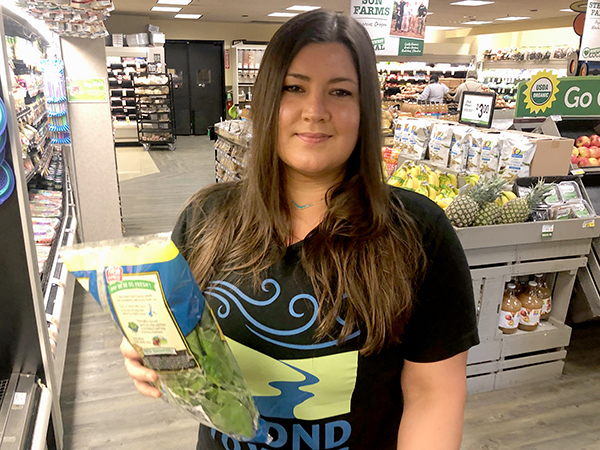 Today we’re partnering with Friends of The Earth to help them release a national study revealing unsafe levels of pesticides in commonly purchased grocery store foods, including data from Oregon. 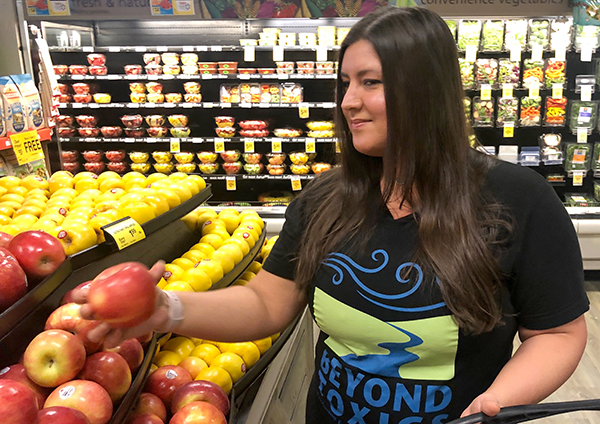 During late 2018, Beyond Toxics representatives participated in this research project by shopping at common grocery stores in Oregon, including Costco and Fred Meyer. We purchased some of the most commonly purchased foods in the U.S., including conventionally-grown apples, fresh spinach, oat cereal, dried pinto beans, and applesauce. We sent them to a lab for pesticide residue testing. The results came back showing that out of 15 states measured in the study, Oregon had the 2nd highest concentrations of organophosphates in apples! It’s important to know that there is no “safe” level of organophosphate exposure–even “low-level” exposure can have serious health consequences, especially for infants and young children. Think about it, if a child eats just 1 organophosphate-treated apple at lunch every day, that child is regularly increasing their chance for brain-damage and health problems later on as their bodies grow and develop. This small amount of pesticide is just too much — and this doesn’t even take into account other chemical exposures children may experience throughout the year…via lawns, parks, school grounds, and indoor settings. It’s time for an aggressive policy reducing the use of pesticides. In response to the growing threat to Oregon’s food security and community health, Beyond Toxics is working with statewide allies to develop a suite of legislative efforts with the purpose of modernizing Oregon’s outdated pesticide policies. If passed, the proposed legislation directs Oregon’s regulatory agencies to ban deadly chlorpyrifos statewide, add bee-killing neonicotinoids to the list of Restricted Use Pesticides (i.e. remove them from consumer store shelves), and ensure that pesticide use is reported to a statewide system to understand and track their environmental impact. These actions will undoubtedly protect the quality and integrity of the food we eat, and lead to healthier children, family and ecosystems throughout Oregon. This kind of policy update comes at a time when federal regulations and values are under attack. Scientific integrity and the protection of public health are being compromised by industry collusion with the current Administration and its oversight of the U.S. EPA. The most vulnerable Oregonians are our children, farm workers and families in rural communities. They need protection from pesticide residues in their food, and pesticide drift poisoning homes, schools, and workplaces. Oregon families should not have health problems and shorter lifespans forced on them because of corporate disregard for human and environmental health. If the EPA refuses to protect the health of our communities, then Oregon decision-makers must do their job to protect their constituents. The health of our communities depends on it. Discolored and sickly Ponderosa pine trees are dying after Perspective herbicide poisoning. Photo taken Sept. 24, 2018. Oregon state and county agencies have breached the law and the majestic Ponderosa pines of Eastern Oregon are dying as a result. The already-parched and receding aquifers are at risk as well. In 2013 an innovative law requiring state agencies to study the consequences of pesticide use and use less toxic methods of killing weeds and pests successfully won bi-partisan passage in the Oregon legislature. Led by Beyond Toxics and sponsored by Rep. Alissa Keny Guyer, Oregon State Integrated Pest Management (HB 3364) offered hope for people and wildlife awash in a dizzying variety of chemical trespasses. Beyond Toxics discovered that the Oregon Department of Transportation (ODOT) made a grievous error in seeking cheaper products instead of safe products! In so doing, they approved the use of the active ingredient Aminocyclopyrachlor. From the beginning of its introduction to the market the EPA identified this herbicide as highly toxic and sought strong restrictions. They ultimately backed off after the chemical industry objected. Poisoning incidents have since begun to stack up. Oregon is now a victim of one of those poisoning incidents. In the fall of 2014, residents of Deschutes County and US Forest Service employees noticed that many Ponderosa pines located along Highway 20 were discolored and sickly. Sampling by the US Forest Service and Oregon Department of Agriculture (ODA) confirmed that over one thousand trees were suffering and dying from exposure to the herbicide Perspective, which contains Aminocyclopyrachlor (ACPC). This potent herbicide was sprayed along the Highway 20 roadside to kill cheat grass. More poisoned and dying pines were also discovered along Highway 97 near Sunriver Resort. More Ponderosa pine trees dying along Highway 20 east of Sisters, Oregon. Photo taken Sept. 24, 2018. If you’ve ever traveled west of the town of Sisters, Oregon you may have encountered a scenic stretch of highway near the Metolius River watershed and Black Butte Ranch lined with giant Ponderosa pines. The land here sits atop some of the state’s most porous soil. All of this–and the integrity of Eastern Oregon’s water table–is at risk from the continuing abuse of a highly toxic herbicide. The death of over 1400 majestic Ponderosa pines is an affront to Oregonians and all those who love the high desert beauty of Central Oregon. Why would ODOT approve the use of highly toxic and persistent pesticides and fail to monitor their impact in the environment? Now that we can see the invisible underground creep of herbicides made visible by acres of brown, crumpling trees, we must immediately determine if the groundwater of the Metolius watershed is at risk. I went on a tour of the affected forest this past summer. The Forest Service revealed they’re discovering the area of dead and dying trees is continuing to expand out from the areas originally contaminated in 2014, 2015 and 2016. That is likely because the notorious hallmark of ACPC is its ability to move through soils, enter groundwater and poison tree root systems. ODOT staff told me that they spray herbicides out 6 feet from the edge of the highway. Yet, during the tour I learned poisoned trees are showing up 10 times farther out than the original spray area! I raised the issue that ACPC is likely poisoning an entire groundwater area and demanded further environmental testing. I found myself wondering if the poison was spreading from tree to tree through the groundwater or is herbicide spreading through the mycelium that connects the trees’ root systems? Representing your interests and protecting the health of people, trees and water, Beyond Toxics filed formal complaints with the Oregon Department of Agriculture (ODA) and demanded a thorough investigation. We let the agencies responsible know we’re prepared to take legal action to protect public lands and recoup the public’s loss of public property. Following Beyond Toxics’ complaint, our questions and insistence that ODA re-open and conduct a thorough investigation, the agency instituted a temporary moratorium banning ACPC on all Oregon roadsides. Thanks to our diligence and intervention we achieved an administrative victory for common sense! Starting this December, Beyond Toxics is invited to attend a stakeholder group to determine if ACPC should be further and permanently restricted. The problem is much more pervasive than merely this incident affecting thousands of Ponderosa pines. Oregon state and local government agencies are on a pesticide treadmill and refuse to consider changing their chemical-dependent ways. The Oregon Department of Transportation’s false argument: We can’t afford to be careful! I asked the ODOT crew if they could mow instead of spray herbicides along the stretch of highway where we stood. Mowing seems appropriate because the land they are tasked with covering is completely flat and the sight lines are excellent. They responded that they only mow once in a 4-year cycle because the agency doesn’t set aside enough money for mowing. “It’s what we have to work with … trying to get the biggest bang for my buck,” was the response from the ODOT staffer. What is the bottom line for residents of Deschutes County? Sadly, the US Forest Service recently determined that nearly 900 Ponderosa pines must be cut down soon. Many more trees will be cut in 2019. And no one knows the potential threat of future damage as the herbicide spreads through the area’s aquifer. Oregonians! Demand a legislative hearing in 2019! Beyond Toxics has asked state legislators to hold a hearing on how state agencies are–or are not–complying with HB 3364, the statutory mandate to be proactive to reduce pesticide use and protect people and the environment from pesticide exposure. So far, legislators are not scheduling a hearing. This lack of action denies the public their right to know how taxpayer and lottery dollars are being spent to buy and spray pesticides on public land. Write to your legislator and let them know you would appreciate their support for a legislative hearing on the (first-ever) 2018 State IPM Report. Neither legislators, nor the public know how poorly state agencies are complying with the law as established in HB 3364. The killing of thousands of Ponderosa pines is Exhibit #1 in a system that may very well be ignoring the will of the people! [Develop] Performance metric results for the implementation of integrated pest management, including but not limited to state agency and public university progress toward the goal of protecting the economy, ecosystems and water quality of this state and protecting the health and welfare of children, the elderly and other members of the public. Thank you for taking the time to read this blog. We hope you will pitch in and get involved. Your input is crucial to the success of the work we do. No child should feel hunger pangs and no family should have to face the prospect of not having enough food to make it through the week. Because so much of the food we eat depends on bees and other pollinators, pesticide-related bee die-offs can directly lead to food scarcity and rising food prices. Imagine you are a hard working parent struggling to put enough food on the table for your family. Despite your best efforts, sometimes your young children go to bed hungry. Now imagine that healthy fruits and vegetables start to become scarce on the shelves of your local grocery store and food prices creep steadily up. Last year, 238,000 Oregonians didn’t have to imagine food insecurity – the lack of reliable access to a sufficient quantity of affordable, nutritious food. One in seven Oregonians, including a staggering one in five kids, really didn’t always get enough to eat. If bee populations plummet, the problem will get even worse. Bees alone pollinate a third of the food on our plates. And it’s not news that bees, and other pollinators, are under attack from pesticide poisoning and other environmental issues. It’s time to deal with neonicotinoids, also known as neonics, the biggest chemical threat to our pollinator pals. There is no excuse for children going hungry in a state that prides itself on its agricultural traditions and progressiveness. We must protect the bees and other pollinators Oregon’s ecosystem, farms and families depend on for most of our food. Hunger has been a real issue in our state for some time. While Oregon no longer ranks as the hungriest state in the country as it did in 2000, we’re still near the top of the list at number 14. And the burden of hunger is not shared equally. Hunger is an environmental justice issue. Poverty is a key indicator of food insecurity and communities of color face a disproportionate share of hunger. The Latinx or Hispanic community makes up about twelve percent of Oregon’s population and has a hunger rate over 30 percent, more than twice the rate of white Oregonians. Similar statistics are true for Native American and Black families too. While we all know about the plight of honey bees, threats to wild pollinators are even more dangerous for our environment and our food supply. As the United Nation’s Food and Agriculture Organization points out, “the vast majority of pollinators are wild, including over 20,000 species of bees.” And wild pollinators may be twice as effective at pollinating crops. Franklin’s bumble bee (Bombus franklini) is in imminent danger of extinction, according to the Xerces Society. That’s why we need your help to get neonic pesticides off of store shelves in Oregon. Neonics are the world’s most commonly used insecticides. They are systemic pesticides; neonics travel through roots and leaves and invade every part of a plant, virtually assuring harm to every pollinator that comes into contact with them. Neonics are devastating to pollinators. In 2013, for example, a neonic pesticide applied to trees in an Oregon shopping mall killed up to 25,000 Bumblebees. Neonics kill bees, butterflies, birds and beneficial creatures at very low doses and they can poison the good microbes in our soil for years. They pollute our rivers and streams – poisoning dragonflies, mayflies and harming the fish that depend on them. Overwhelming scientific evidence shows neonics and other systemic pesticides harm key species and send rippling impacts throughout entire ecosystems. We must take action now to save Oregon’s vulnerable native bees and the beneficial insects at the core of the food chain, and everyone who depends on them. That’s why Beyond Toxics is introducing strong new policy initiatives to solve this problem with support from our friends in the Oregon Pollinator Protection Alliance. Taking neonic pesticides off of store shelves is a top priority for our work in the 2019 legislative session in Salem. Currently, anyone in Oregon can buy neonics, often unwittingly. Pesticide products commonly used in home gardens often have no warnings – so home gardeners can apply neonicotinoid ingredients at much greater rates than is considered safe in commercial agriculture practices. Shockingly, some of these products recommend drenching the soil every six weeks, causing repeated exposures for all nearby creatures. With your help, we keep the highly toxic, systemic chemicals out of our rivers, streams and gardening soils to protect Oregon’s native bees and other pollinators. Please donate today to support our work. Together, we can ensure that the most vulnerable members of our community don’t have to feel increasing hunger pains brought on by food insecurity from collapsing bee populations. Bee City Eugene – what’s next? By becoming a Bee City, The City of Eugene has formally acknowledged the importance of pollinators to healthy ecosystems and joined the national movement to protect and support our pollinators now and in the future. Bee Cities support collaboration to establish and maintain healthy pollinator habitats within city limits. The City of Eugene will now begin conversations about how to grow local, native plants that sustain local pollinator species. The City has also committed to participate in ongoing conversations about how to reduce and eliminate chemicals that are harmful to pollinators, our food security and the planet! Among the promises made as part of being an official Bee City, the City of Eugene will work with communities to raise awareness about pollinator diversity and the benefits of using native plants in habitat restoration. We must recognize how vitally important pollinators are, and pledge to do whatever we can to encourage and support them. For anyone with a garden, we can all create pollinator friendly spaces by growing plants that will provide food, creating shelter, leaving space undisturbed for pollinators to build nests in the soil and creating a safe, pesticide-free environment. For those without access to gardening space, we can volunteer some of our time supporting local pollinator habitat restoration efforts, write letters to our legislators to support strong policies to help protect these amazing creatures, and choose to spend our money at local businesses that support pollinator protections! Last November, I took my daughter to see 350.org’s community showing of Al Gore’s climate change film, An Inconvenient Sequel: Truth to Power, at Central Lutheran Church. I walked into the showing-room sanctuary where a man played the organ and multi-colored light crashed in through the stained glass windows. It seemed an appropriate venue to learn what humans are doing to one another and creation—this room was a place where many contemplated their idea of a creator. As Al Gore says, this is a moral issue. I’d wrestled with whether to expose her to the same truth that had thrown me into despair in my youth. The look on my daughter’s face as the movie described our current crisis made me wonder if I’d made a mistake. She has a right to know, though, as do all the children whose futures are being decided by our present action or lack of it. We need all hands on deck, and Mr. Gore did balance the message of current doom with one of future hope—a belief that humanity can change. Gore mentioned the Climate Reality Leadership Training Corps (CRLTC) at the end of the film. I did a little research and, before I knew it, was hugging my daughter goodbye at the Eugene Airport, boarding a plane to LA for the CRLTC’s conference and training. I’d joined up with the Climate Corps. Mysti standing with 2,220 climate activists from around the world who attended the Climate Reality Leadership Training Corps in 2018. The base of operations for our training was the Los Angeles Convention Center, in the heart of downtown LA. Lines of training attendees pushed out the door until we finally joined 2,220 climate activists from around the world in a stadium-sized room. People looked like I felt, mostly overwhelmed and nervous. The United States’ first Youth Poet Laureate, Amanda Gorman, opened with a poem. Her voice rolled like waves, baptized us with renewed hope, and restored our faith that, together, we can corner and solve this thing. Renewable technologies shouldn’t be reserved for the rich alone. The working poor are hit the hardest by high gasoline prices, those of us who could never afford a Tesla—that sleek, all-electric vehicle I dream of daily. However, if we demand green technology we know the price will drop and that poor and working class people will finally have access to energy-efficient technologies. Who wouldn’t choose technologies that save them money while saving the planet? I can’t think of a better reason for pushing solar panels and electric cars into the market, which will blast the green revolution forward. Former California State Senator Fran Pavley, called “the mother of California climate policy,” spoke about their battle to pass California’s Clean Car Standards in 2002. That law inspired 13 other states to do the same—Oregon among them. This landmark bill was the nation’s first to set limits on global warming pollution coming out of our tailpipes. President Trump’s declared intent to attack this trailblazing legislation caused all of us to question his moral competence and only served to strengthen our resolve. Gore impressed on us the need to not only strengthen our resolve, but hasten its pace with his announcement about a bill being voted on in the California Senate that would require 100% renewable energy by 2049. The bill had failed earlier that morning but had made it to a second vote in the afternoon. Gore asked every Californian in the audience to call their representative immediately. The room erupted with excitement. Apparently, the California Legislature recognized this inevitable progress. Later that day they passed the bill to have 100% renewable energy by 2049. The bill was then immediately sent to Gov. Brown of California, who promptly signed it. If California can do that, so can Oregon. This is why I’m pumped and prepared to fully support legislation like Renew Oregon’s Clean Energy Jobs bill. By working as a climate educator, activist and champion of climate justice I can do my part. Voting is key, and we all know it is essential to motivate young people and future voters to participate. I must step up now because we are running out of time. My goal is to educate my community. Climate change is a bipartisan issue that affects all of us and it is not a political issue, it is a moral one. We must demand that our elected officials make fossil fuel independence a major focus and if they don’t, we, the people, will organize an army of voting activists to defeat them. We are ready. We will win this! Vote like your children’s lives depend on it. Because they do. My daughter is very proud of me for becoming a climate reality leader, and that, my friends, is the best feeling in the world. I wanted to share my story with you with the hope that it will inspire you to take action. I have lived in the Eugene area for over 15 years. My grandparents moved here in 1980 and bought a beautiful farm just outside of Cottage Grove. As an environmental justice organizer for Beyond Toxics I have great concerns about the air quality in our state and the effect it has on children. Western Sugar Company factory in Billings, Montana. I moved here because I thought Oregon was a clean, healthy state to raise my child. Eugene looks very green and sustainable compared to where I was born, Billings Montana. My father was a member of the Crow Tribe (and still is) and had a small house just outside the Crow reservation. This house was built by his father when nothing else was built in that area of town. Then, a sugar beet factory was built just a short distance away. I can still remember the horrid stench of the air. There were many days when the smell made me gag and run inside my house and close all the windows. It gave me headaches and nausea. I developed childhood asthma, which plagues me even today. My parents could not afford the expensive asthma medication. As a kid I experienced asthma attacks so severe I thought I would die. I would not wish this on any child, anywhere. As a young child I was so often left gasping for air, searching all over my house for an inhaler, hoping there would be a tiny bit more medicine left inside. I remember feeling hesitant to ask my parents to scrape together the money to pay for my asthma medicine, year after year. The feelings of guilt, shame and utter desperation haunt me still. As I got older, I learned about air pollution and further investigating air pollution specifically emitted by sugar beet factories. I learned that sugar beet factories, along with the foul stench, emit hydrogen sulfide. It is well documented that hydrogen sulfide has many human health risks, asthma among them. This is the typical environmental justice story. A polluting industry moves into a minority community, dumps their toxins and manages to evade responsibility for the human suffering it causes. I am pretty sure that the sugar beet factory will never know the suffering they caused my family and me. Far too often, polluting businesses use the threat of job loss as their reason not to invest in cleaner technology. They place a burden of guilt and fear on their employees, threatening their jobs if they are made to comply with new regulations. What about the burden placed on my family in Billings? What about the burden on West Eugene families? In West Eugene we have factories that emit toxic chemicals into the air that impact nearby neighborhoods. Childhood asthma in West Eugene is at 14%, nearly double the state average. Please keep in mind that early exposure can lead to cascading harm over a life time. Children are more susceptible to the harmful effects of chemicals and deserve regulations that provide additional protection. There is already a precedent for lower thresholds to protect children in toxicology models. It is clear the science is here to back up the work Oregon’s regulatory agencies need to do. Now the question is a moral one. If you would like to let our state government know about the importance of clean air to you, please use the DEQ online form. You can reference talking points created by Lisa Arkin to help craft your testimony. Deadline: Monday, August 6th at 4 PM. Mysti Frost is the Environmental Justice Community Organizer for Beyond Toxics and has been elected to be a member of the board of the Lane Regional Air Protection Agency. This blog is a modification of the testimony submitted to the Oregon Department of Environmental Quality for their Cleaner Air Oregon program. Tags: air pollution, asthma, Cleaner Air Oregon, DEQ, Mysti Frost, Oregon Department of Environmental Quality, West Eugene, Western Sugar Co.
Bombus appositus, a.k.a., white-shouldered bumblebee, is one of the native bees we found in the Whilamut Natural Area during our Pollinator Week Bee Survey with Walama Restoration and Oregon Bee Atlas. While working alongside other local naturalists and bee-enthusiasts at the 2nd Annual Bee Count, I was thrilled to discover that at least 24 different species of native bees have returned to the Whilamut Natural Area, a rehabilitated prairie habitat north of the Willamette River. This was a remarkable turn-around for this area since non-herbicide habitat restoration efforts were implemented 14 years ago. During Pollinator Week, representatives from Beyond Toxics, Walama Restoration Project, Mount Pisgah Arboretum, and Oregon Bee Atlas worked with our community to identify and track wild and native bees in the Whilamut Natural Area. I am happy to report some of the pollinator species have returned to this area since non-herbicide habitat restoration efforts were implemented. We discovered that at least 24 different species of native bees have returned to this rehabilitated prairie habitat. A naturalist for over 30 years in the Eugene area, Rick Ahrens is associated with Nearby Nature, West Eugene Wetlands, and Mt. Pisgah Arboretum. The east Whilamut Natural Area (WNA) is an urban park that has been recognized by the City of Eugene as valuable habitat to OUR natural plant communities – upland prairie, oak savanna, and riparian woodland – that support native pollinators, birds and other wildlife. A long-term priority for the east WNA is to provide non-toxic habitat and forage for native pollinator species by introducing a large diversity of native plants without the use of pesticides and herbicides. In the 60s and 70s, the east WNA was a toxic landfill–literally a dump where pollinator diversity was presumably zero. Transforming this area from a former landfill site to a vibrant prairie plant community, without the use of pesticides or herbicides, has significantly boosted the biodiversity in this natural and recreational area. The Whilamut Natural Area also helps non-profit organizations educate community members about the importance of non-chemical land-use decisions, especially adjacent to river banks and native pollinator corridors. There was such an enthusiastic response to our bee survey that we plan on doing much more native bee monitoring in the coming year. Ongoing monitoring is needed to better understand the species diversity and richness within this bio-diverse natural area.